Inspection done Aug 25 2007 by Warren and Paula Lee visually by boat. All of the windows were closed and intact.There is what appears to be rotten wood near the bottom left corner of the Eastern most top window. The french doors on the northern side are wide open and folded back to the wall. Leaving about a six foot opening to the rain. The wood landing platform is in pretty good shape with a couple of top boards missing.The lighthouse handrails are really in horrible shape. The under side supporting steel really needs a good chipping and painting. The wood outside needs grinding and painting. We really need to schedule some work or paint party's for it. My best guess if we buy one of the new paint remover grinders is that it would take about seven full man hour days of work to remove the outside paint using one grind. If we can get enough people to do the work. That is working in shifts and keeping the machine going non stop we can do one side a day. Paint removal, priming and painting. We need signs to install at the site cautioning the public about the danger. There is much rope around the metal work at the bottom an indication of boats tying off to the lighthouse angle braces. Some of the angle braces seem loosed from the pounding of boats working on the ropes. We need signs warning of fines if anyone is caught doing this. Warning! Unlawful to tie your vessel to any Aid to Navigation. Your may be subject to fines and arrest if you tie off here. Please anchor and fish. Thank You! I will try to get out next week and secure the doors in case we get a hurricane coming. We have heard back from the Alabama Historical Commission 8-24-2007 and they have approved Thompson Engineerings plan for emergency repairs at the Sand Island Lighthouse. We intend to do emergency repairs totaling around $350K right now. Once a contract with the Town Of Dauphin island and Thompson has been created and approved. 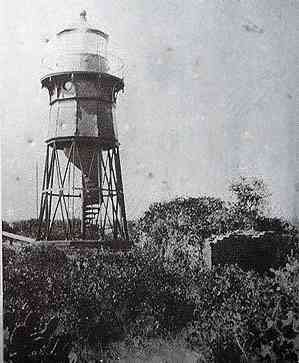 Thompson will help us engineer,plan and oversee the work on the Sand Island lighthouse base. We intend to repair the ring around the bottom and repair some of the damaged cracks and bricks near the bottom. We are scheduling the repairs to be done in the spring of 2008. Winter will be on us before we can undertake the repairs this summer. Many yards of concrete and tons of materials will have to be transported out to the lighthouse and much planning and work will have to be done. We just do not have enough time this summer to get it done. 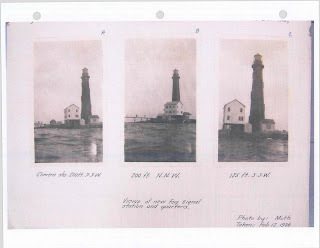 I have received a lot of historical photos of the Sand island lighthouse from Daniel Scarcliff on Dauphin island and will work on editing them and examining them in microscopic detail to gather whatever information I can about historical data related to the lighthouse. Daniel went to the National Archives at his own expense and got these photos to help the lighthouse project with. In the past we have been able to learn several important details from these antique photos. Thompson Engineering has finished the long awaited report that will document the present day condition of the Sand island Lighthouse. This report is the product of thousands of hours of work by Thompson Engineering, The Town Of Dauphin islands, all volunteer lighthouse committee and the all volunteer 501C3 nonprofit Alabama Lighthouse Association. OK, so what the heck have you guys been doing this for? This report was required for several reasons. 1. It will determine the best way to preserve the lighthouse for future generations to enjoy. 2. It will examine the different methods and costs of relocating the structure and determine if it is practical to even attempt to move it. 3. It will provide several design options and estimate the cost associated with the building of a man made island that would function as a public park and recreation area at the site. 4. This report will be the foundation for the development of a business plan that the Town Of Dauphin Island will be asked to approve that will be administered by the Alabama Lighthouse Association in conjunction with the Dauphin Island Sand Island Lighthouse committee. In a nut shell it gives us the information we need to make and intelligent decision about what we will be doing with the Sand Island lighthouse in the future. Remember our end goal is to preserve, protect the lighthouse's and develop a public recreation area from the sites that you and yours can enjoy forever! Welcome to the lighthouse blog. I have started this blog to try and keep all of the hundreds of people who are asking me for information updated as to where we are on the various lighthouse projects we are currently working on. I hope you enjoy this new forum.